We are proud to have the largest stock of automotive electrical components in the South West of England. If we don't have it, we'll try our best to get it! 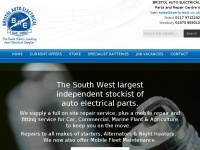 Bristol Auto Electrical Suppliers - Auto Electrical Parts & Mobile Auto Electricians. Car auto electrician near me Bristol/Westbury.